Chanteuse Rockabillly US née le 26 Avril 1938 à Memphis (Tennessee). Barbara Pittman se présente à l'âge de 12 ans à la Sun Records de Memphis (Tennessee), sans succès. Persévérante, elle se perfectionne et en 1956, enregistre un premier single à la Sun. Barbara, Vocalsiste complète, pouvait chanter du Rock 'n' Roll, de la Country Music, du Jazz et des ballades avec une aisance stupéfiante. Elle est décédée le 29 Octobre 2005. 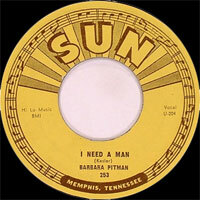 Barbara Pittman's claim to fame is that she was the only female artist signed to Sam Phillips' Sun Records -- other women recorded for the label, but only Pittman was given a contract. That alone would secure her place as a footnote in music history, but Pittman also cut one exalted rockabilly classic during her Sun years: "I Need a Man." Pittman was one of 12 children born to a family in Memphis, TN, in 1943. Her mother was acquainted with Gladys Presley, and Pittman attended the same school as Elvis. Pittman harbored musical ambitions from an early age, and approached Sun Records before she was even a teenager. When she was turned away because of her age, the dauntless Pittman found work with a local band (thanks to a recommendation by Elvis, Pittman says) before touring with western star Lash Larou in 1955. Returning to Memphis in 1956, Pittman began singing with Clyde Leoppard's Snearly Ranch Boys and found work as a demo singer for Stan Kesler, who hoped that her acquaintance with Presley would give a boost to a song he had earmarked for the popular rock & roller. The resulting demo of "Playing for Keeps" convinced Presley to record the song and brought Pittman to the attention of Sam Phillips. She cut the classic "I Need a Man" backed by members of Leoppard's band. The record was unsuccessful, but Pittman appeared on Sun package tours and continued to make recordings for Sun, many of which were not released. When other labels expressed an interest in Pittman in 1957, Phillips retaliated by offering her a contract, making her the only female artist to be honored thusly. 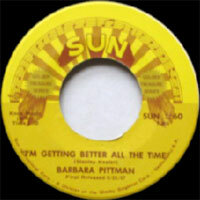 Phillips let her choose whether she wanted to record for Sun or his new Phillips International subsidiary, and Pittman selected the latter because she thought it had a more attractive label design. She recorded several sessions with Sun players like Billy Lee Riley and Bill Justis, but her recordings ranged from teen-oriented pop to bluesy balladry, with little of the rockabilly and rock & roll for which she later would be celebrated. 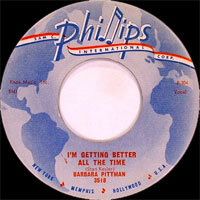 A one-off single with the vocal group the Sunrays also failed, and Pittman released her final Phillips single in 1960. Several radio stations deemed the flip-side, "Eleventh Commandment," blasphemous and banned it from airplay, further crippling an already doomed record. Pittman left Phillips International for Del-Fi, but no recordings were issued. Throughout the '60s she performed on cruise ships and military bases, and sang on the soundtracks of motorcycle movies such as Wild Wheels and Wild Angels. In the '70s she married, and with the rockabilly revival her reputation grew as her Sun recordings were reissued on compilation albums. 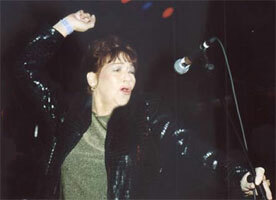 In 1983 she formed a band in Houston, TX, and played at European rockabilly festivals. Pittman's legacy is built upon three or four essential tracks, but the squandered opportunities surrounding this husky-voiced singer are nearly as fascinating as the records she made. 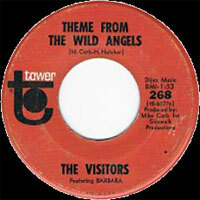 1966 SP TOWER 268 (US) The VISITORS (feat. Barbara PITTMAN) - Theme From The Wild Angels / Is It Them Or Me?